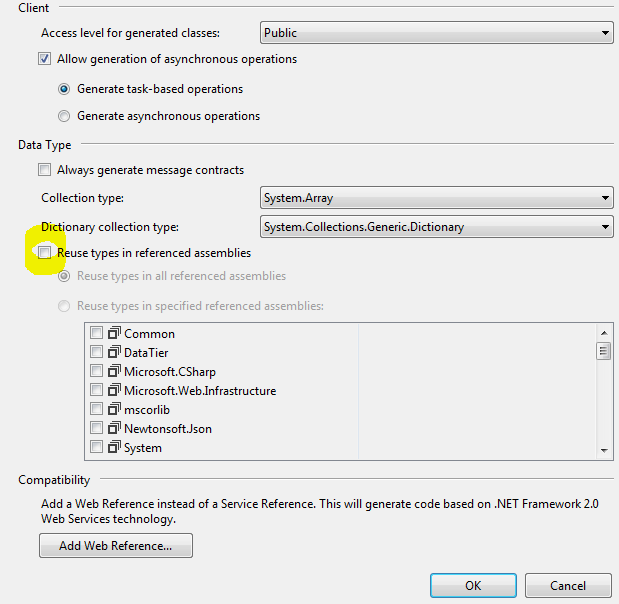 I am trying to setup a VS2010 project in VS2012 and have a problem with generating the service references. Somewhere it fails and Reference.cs becomes empty. But since the code is working for VS2010 I would prefer not to change anything. Then it appears code in Reference.cs but some functions is missing so the project doesn´t work. Is there any known problems when doing this? I am totally stuck and need some ideas. I often encounter this problem, this workaround works most of the times. Not the answer you're looking for? Browse other questions tagged visual-studio-2010 wcf visual-studio-2012 or ask your own question.